Arinzé Kene's Misty tickets now available for the Trafalgar Studios transfer! Following its sold-out run at the Bush Theatre, Arinzé Kene's acclaimed, “big popular hit” (Evening Standard) MISTY transfers to London’s Trafalgar Studios for six weeks only. In a playful, profound and unique take on modern life in London, Arinzé (Girl from the North Country, Lion King, EastEnders) delivers a powerhouse performance blending theatre and song, on a constantly shifting stage, with live musicians performing during the show. 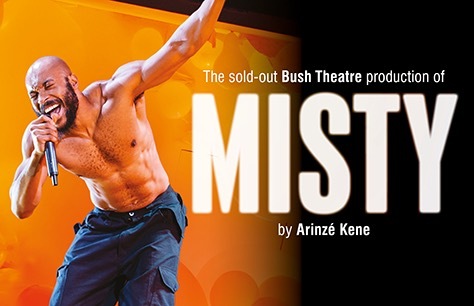 Misty tickets sold out at the Bush Theatre run, so book your tickets early to avoid disappointment! Please note Kibong Tanji will take the lead role for one performance on 8th November matinee. 8 September - 17 November 2018. Please note that this production contains strong language, which covers violent, sexual and racially charged themes. Strobe lighting, bursting balloons , loud noises and haze effects are used in the show. I have been going to a lot of theatre (when I can afford it) for over 40 years and can say that it ranks as one of the best theatrical experiences I have ever see. Part Luther (Idris) Part Berkoff (Steven) Part Tricky (er Tricky) it was thought provoking powerful with an inevitable path to the protagonist's destruction. Excellent musicians/support actors too. Please re run this show. I saw on the penultimate night and wanted friends to see it but it was too late. many thanks for an amazing evening. Reading the screenplay as I type. Mike.